After failing to show up at the initial request of the Court, State Pathologist Dr. Vivekanand Bridgemohan, yesterday appeared at the Georgetown High Court, where he testified in the murder trial of Steve Allicock. Allicock is facing Justice Navindra Singh and a mixed 12-member-jury at the Georgetown High Court for the murder of Wendell Tappin. Tappin had left his home on New Year’s Eve to collect a phone that he had given to someone to charge in Hill Street, Albouystown, when he was confronted by two men; one of them held him down while the other chopped him. Steve Allicock of Albouystown was one of the persons implicated in the slaughter of Tappin in Albouystown. He remained on the run for five and a half years before he was captured. His father, Leonard, and his uncle Randolph, were also charged with the murder. Randolph Allicock never appeared before a judge but after a lengthy high court trial conducted by Justice Diana Insanally before a 12-member mixed jury, Leonard Allicock was acquitted of murder. After evading capture for some five years, police acting on information, staked out a house at Soesdyke where Steve Allicock was said to be hiding and captured him in 2015. Last Friday, Justice Singh issued arrest warrants for Dr. Bridgemohan and Natasha Tappin, the sister of the deceased after they failed to show up at the initial request of the Court. Yesterday, both Dr. Bridgemohan and Tappin appeared before the Judge and Jury at the High Court. They were the final two witnesses to be called to the stand by State Prosecutor Tuanna Hardy. Bridgemohan was the first to testify. He outlined that a post mortem examination was conducted on Wendell Tappin in the presence of a Police officer and a relative. Based on his examination, the doctor concluded that Tappin died as a result of the stab wounds he sustained on several regions of his body. Before leaving the stand, the doctor issued an apology for his absence on the previous occasion of the trial. Natasha Tappin, the sister of the deceased, testified that she had visited the scene immediately after her brother was chopped. A nervous looking, Tappin recalled seeing her younger sibling lying in a pool of blood on the road on the day of the incident. The witness told the court she was quite emotional at the time and as such she could not recall who was present at the time. Following the testimony of the witnesses, the Prosecution indicated that they had closed their case. The accused was therefore called upon to lead his defence. From the prisoner’s dock, the accused told the court that he was not in the country at the time of the incident; he was in Suriname. Last week Police witness, Dharampaul Etwaroo, told the Court that Allicock had given an alibi after he was arrested for 2009 killing of Albouystown resident, Wendell Tappin. During his testimony, the officer told the court that in May 2015, he contacted the accused, Steve Allicock at the Golden Grove Police Station and put the allegation of murder to him. The officer said that this was after the father of the deceased had pointed out the accused as the person who stabbed and killed his son on December 31, 2009. In response to murder allegations put to him, the policeman told the court that Allicock related that he had an alibi. As result, Detective Etwaroo said a confrontation was held between the accused and the father of the deceased. During the confrontation with the father of the deceased, the officer recounted that Allicock repeated his statement. Questioned by the Prosecutor the officer told the court that he could not say why it took investigators so long before Allicock was charged for the murder. 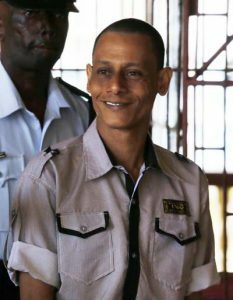 Under cross-examination by Defence Attorney Maxwell Mc Kay, the Policeman told the court that he made no checks to substantiate the alibi provided by the accused.